Hard Maple | aka: Sugar Maple or Black Maple. Growth: Eastern US, mid Atlantic and Lakes states. They are cold weather trees favoring northern climates. Description: Sapwood is creamy white with slight reddish brown heartwood that varies light to dark reddish brown (varies according to region). Straight uniform grain can also have “curly” “fiddleback” or “bird-eye” appearance. 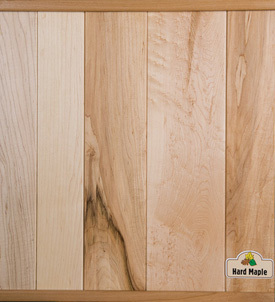 Working Properties: Hard maple is slow drying with high shrinkage. Pre boring recommended for nailing and screwing. Finishing: High resistance to abrasion and wear. Stains well suitable for most brown tones. Accepts both oil and water based products.